Arroz con leche is a sweet, creamy, and rich Cuban rice pudding. There are countless varieties on this quintessential Cuban classic, but this is the easiest and very best recipe you’ll find. Evaporated milk, lemon peel, orange peel, cloves, raisins, whole milk, and all the other whosits and whatsits that other recipes call for have no place here. This recipe is no-frills and no-fuss- plus it’s my abuela’s arroz con leche recipe and that makes it the best on this planet. Pearl short-grain Valencia rice– in all its creamy starchy glory- is the only kind of rice to use for Cuban arroz con leche. My abuela’s arroz con leche is decadent and homey, and it will have you asking why on earth you ever added all those silly other ingredients in the first place. As the water boils with the cinnamon sticks and slightly browns, the fragrant warm spice perfumed the air bringing back many a fond memory. I recall eagerly waiting over the bubbling arroz con leche waiting for my abuela’s nod of approval that dessert was finally done. We both stood armed with spoons ready to scrape up the thick and gummy goodness that builds up along the sides and on the bottom of the pot. Arroz con leche is made with a lot of love and requires constant stirring. This rice pudding is worth the wait and is a real treat served warm or cold sprinkled with a little extra cinnamon on top. Put about 4 or 5 cups of water to boil with a pinch of salt and the cinnamon stick (I made a double batch- hence the extra cinnamon sticks and ingredients pictured). Add the unwashed rice and boil the rice until it opens over medium heat while moving the rice once in a while. Washing the rice removes some of that starch that makes it creamier and wonderfully thick. When the rice is ready after around 20 minutes or so, add the condensed milk moving constantly. Continually scrape along the bottom and sides to prevent burning the arroz con leche. Seriously- just stay standing by the stove-top and stir! It can quickly burn and will ruin the entire batch. Stir the dessert softly until it is like a cream, and you can temporarily see to the bottom- this takes around 10-15 minutes. In the first picture below you can see that the rice pudding is much too soupy and needs about 10 more minutes of constant stirring over low heat. In the middle picture, the arroz con leche is just right as you can see the bottom momentarily when stirring. Stir in the vanilla and remove from heat. Remove the cinnamon sticks from the arroz con leche and discard. Serve the arroz con leche in individual cups, sprinkle with cinnamon, garnish with a cinnamon stick if you like, and enjoy warm or cold. I made a double batch which serves around 10-12 generous portions. Cuban pastries called pastelitos are classic Cuban treats that will brighten up any breakfast, party, or 3:05 cafecito. You might be surprised to hear that homemade Cuban pastries, those delicious pastelitos that you so crave and grew up eating, are EASY to make at home. Baked in buttery puff pastry, they are often filled with tropical sweets (like guava, mango, coconut, dulce de leche, and cream cheese) or stuffed with meat like shredded chicken or picadillo (we’ll make that filling another time for Cuban empanadas). Like many Cubans and tropical fruit lovers, I am obsessed with guava. Conchita brand guava marmalade poured over cottage cheese, mixed with thick Greek yogurt, spread on crackers with cream cheese, or stuffed into delicate layers of puff pastry- oh the possibilities are endless! Today I am making Cuban pastries filled with guava and cream cheese also known as pastelitos de guayaba con queso. The cream cheese is lightly sweetened and the guava melts to a sticky liquid between the flaky pastry (half the adventure of eating these Cuban pastries is trying to avoid getting golden pastry crumbs all over yourself). Once the Cuban pastries are baking in the oven, the guava becomes molten hot lava- seriously ridiculously hot. The aroma of the fresh baking Cuban pastries will make your mouth water, but I urge you to wait around 10-15 minutes or even longer to allow the molten guava middle to cool. Break these pastries apart to enjoy with a steaming cup of café con leche or a little afternoon cortadito. Follow instructions on the box to defrost the puff pastry on parchment paper (this can be done overnight in the refrigerator or quickly on the countertop for 40 minutes). You can also be a real go-getter and make your own puff pastry!! Frankly I’m too busy, and the store-bought stuff is damn good too. Set the cream cheese out to soften on the countertop. When soft enough add half the sugar and vanilla, mix well, and set aside. Microwave ¼ cup of water for 30 seconds, and mix with the remaining half of the sugar to create simple syrup. Allow the syrup to cool. Cut guava paste into rectangles of even thickness, cut in half, and lay evenly spread apart on the puff pastry. Top guava with sweetened cream cheese and then place the other layer of puff pastry on top. Brush the top of the pastry with simple syrup. Cut the Cuban guava pastelitos before baking in the oven. Bake at 400F for 20-25 minutes or until golden brown on top. Once again, I must repeat for the sake of your tongue’s safety…do NOT eat these until they have cooled down! The guava and cream cheese will be extremely hot, wait at least 15 minutes for maximum enjoyment. Tocino de Cielo was my abuelo’s favorite Cuban dessert. The sweet yellow custard is heavy on the yolk and rich decadence in each sugary bite. My abuelo loved sweets and was notorious for drinking insanely sweet coffee and adding sugar to batidos or milk shakes. Tocino de cielo is like flan’s distant cousin. Flan is very very easy to make, but tocino de cielo requires a little more timing and gentle handling. This recipe is my abuela’s, and it is the very best tocino de cielo recipe on the planet. The name translates roughly to bacon of the heavens or sky, a name which alludes to its sweet greatness. My abuelo loved when she would make it for him, and my mom would always make it for him as a treat. I tried to make it once from a random website as a surprise for my mom, and the recipe was god-awful- I mean seriously terrible and nothing like the delicacy I knew. Thankfully my mom supplied me with abuela’s handwritten recipe- the secret to perfect Cuban tocino de cielo. I imagine tocio de cielo being served in tiny portions during a 9-course meal, with each dish more decadent than the last. This dessert is incredibly rich, so smaller portions are advised. Your sweet tooth will be satisfied with a small amount of this traditional Cuban dessert. 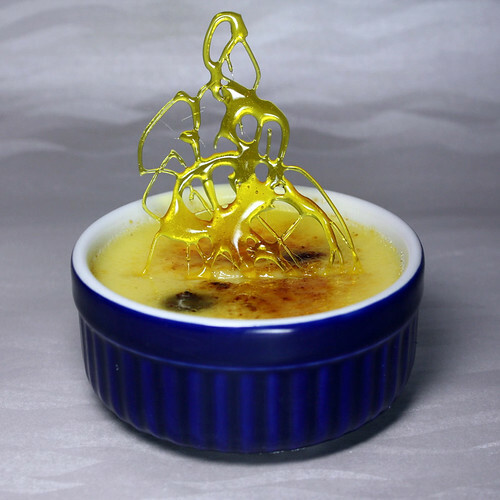 The bright yellow dense custard of this classic Cuban sweet is perfectly golden on top and swims in a caramel sauce. Although flan is my preferred dessert, tocino de cielo will always make me think of my abuelo and how much I miss him. Boil water, sugar, and lemon twist until it thickens and is reduced to 1 cup. You MUST constantly stir this mixture. I repeat CONSTANTLY stir. My initial attempt at making this thick syrup failed terribly. I made hard butterscotch candy…hahaha seriously…it was rock hard. Trust me, stir the syrup constantly, this takes around 7-10 minutes. I recommend putting the temperature to around 6-7 on the burner dial. The syrup can quickly burn! Pour the contents into a cup measure, if it is slightly over that is fine, it’s better to just go with that than cook the syrup for longer and risk overcooking it. Allow the syrup to cool. In the meantime heat 1/2-3/4 sugar in the Cuban flanera (flan mold) on low heat. This will create the golden amber caramel that pools on top of the tocino de cielo. In this original recipe my abuela had written ½ cup yolks and ½ cup eggs, we have translated this to mean 6 egg yolks and 3 eggs. Beat yolks and eggs just until they are juuuuuust mixed. Add the cooled simple syrup and the vanilla. Strain through a colander (this step is important otherwise there are ‘tough’ parts in the custard) and pour into a flanera . Bake at 350F for 1.5 hours en un baño de María (or a water bath). Hint: put the baking pan on the oven shelf and THEN add the water to the pan. Once finished baking in the oven, allow the custard to cool on the stove-top before placing in the refrigerator overnight. Before serving run a knife along the edge of the custard. You can garnish the tocino de cielo with the candied lemon peel used in the simple syrup, with fresh raspberries, or spun sugar. Place a plate on top and invert the tocino de cielo in all its golden glory. *Knock gently on the back of the flanera to release the Cuban dessert from the mold if it doesn’t come out immediately.